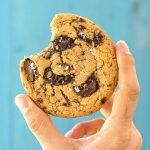 This recipe for vegan olive oil and tahini chocolate chunk cookies is a one-bowl recipe and one of the easiest you’re going to make! The Mediterranean cuisine may have a lot of easy, one-bowl cookie recipes like these vegan and crunchy Greek sesame and olive oil cookies – but it hasn’t any American-type chocolate chip ones. 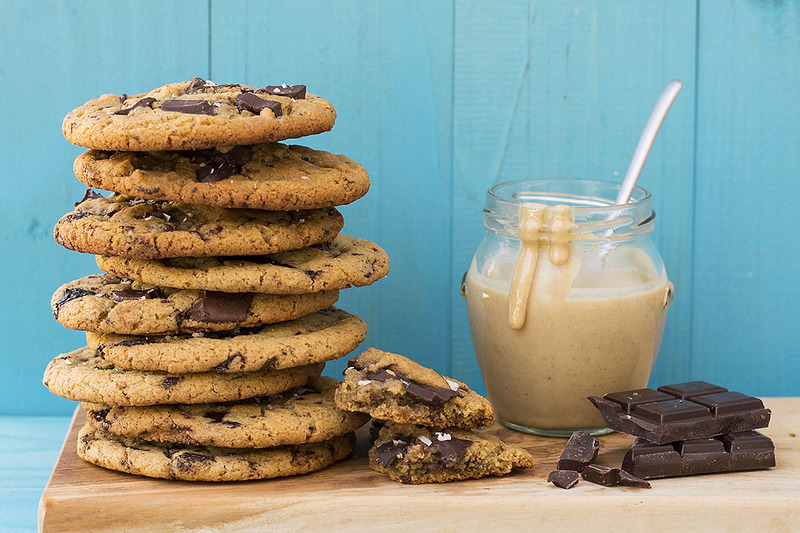 So it is easy to say that this recipe combines the best of two worlds and creates a healthier cookie with intense chocolaty taste and nutty undertones. All you have to do is just mix some ingredients with a fork or a whisk, add the flour and the chocolate chunks and chill the mixture in the fridge. Since the dough doesn’t contain any eggs or dairy, you can make a large batch, keep it in the fridge for several days, and bake some cookies each time you feel the need! The only thing you have to be careful of is to not overbake them! 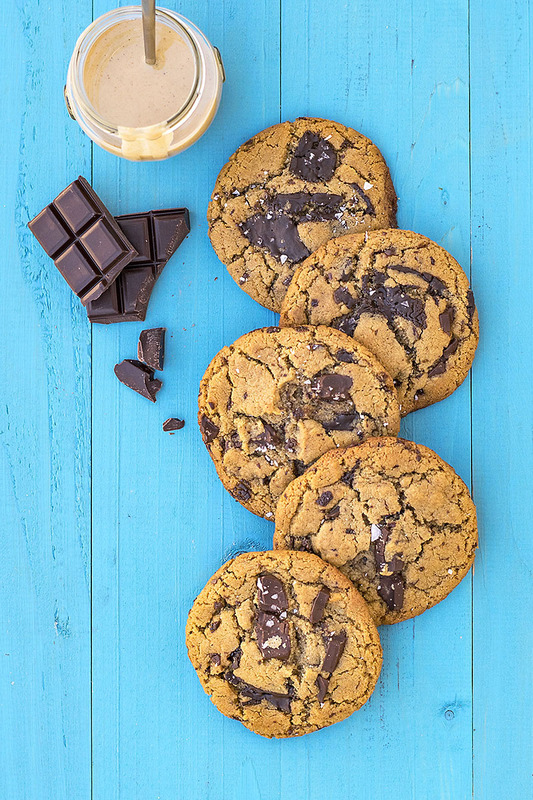 The original version of the cookies you see here are these big, soft and chewy tahini – olive oil chocolate chunk cookies which are some of the best cookies I’ve ever made! They too can be made vegan if you just substitute 1 tablespoon of ground chia seeds (or flax seeds) soaked in 4 tablespoons water for the egg. But let’s be realistic. Not everyone has ground flaxseeds or chia seeds in their kitchen. I personally don’t keep ground flaxseeds because I’m afraid they’ll become stale too quickly, so at times when I need a small quantity I just use my pepper mill to ground them. Anyway, it’s just nice to have a vegan cookie recipe with simple, everyday ingredients which everyone has in their kitchen! Why use chopped chocolate and not chocolate chips? 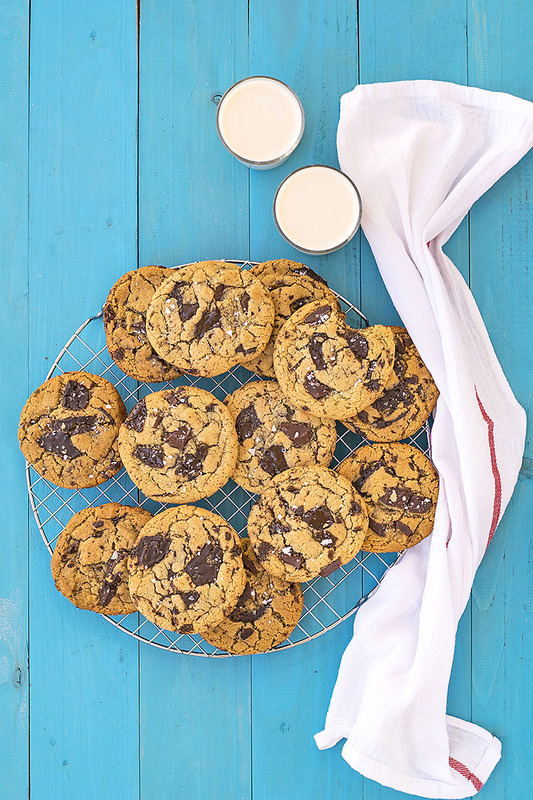 Since chocolate is a basic ingredient in these cookies, it goes without saying that you should use a good quality one. And in general, a good chocolate bar will be of better quality than many chocolate chips… But that’s not the only reason. Chopping the chocolate will create pieces uneven in size and shape plus many trimmings. The trimmings scatter throughout the dough giving it a wonderful chocolaty flavor, and the variously shaped chunks make the appearance but also each bite more interesting! 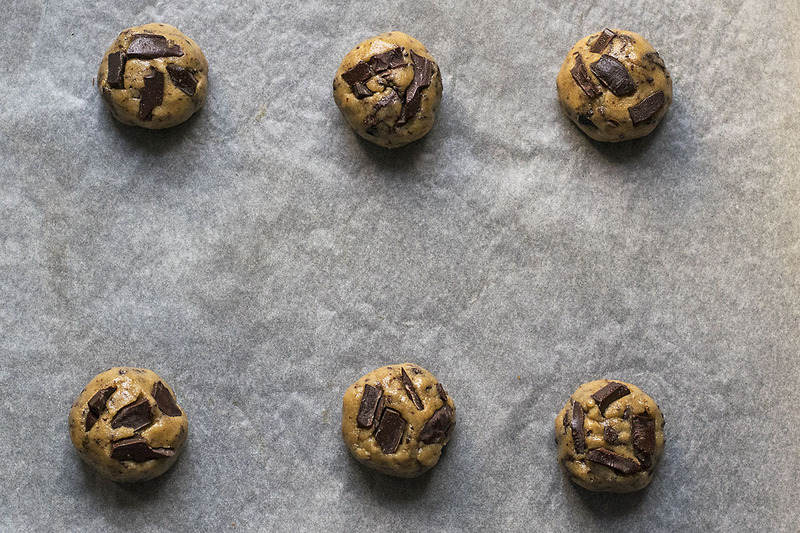 There are two things you should have in mind when making these cookies. Chill the dough very well in the fridge to prevent the cookies from spreading too much. Use chopped chocolate instead of chocolate chips. The uneven pieces and the trimmings of the chocolate contribute to better texture and taste! As with all cookies of this type, don’t over-bake them! 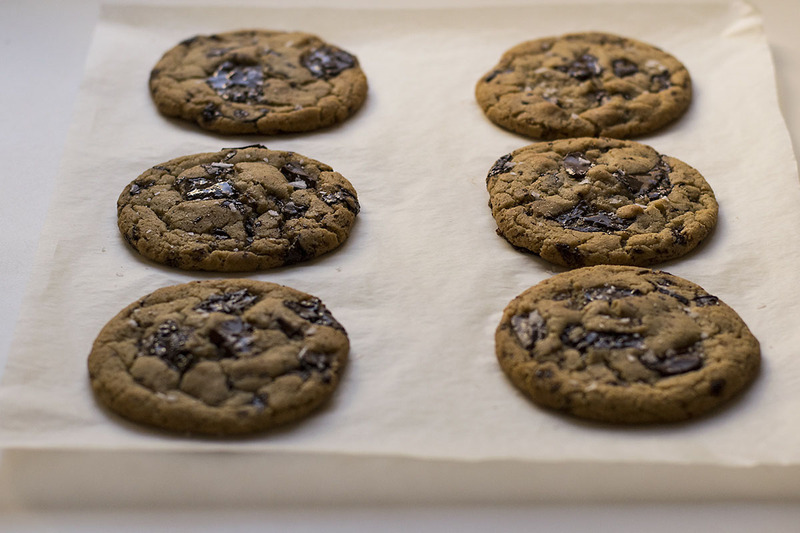 The centers of the cookies should seem slightly underbaked when you take them out of the oven. Some sea salt flakes for topping. Transfer the olive oil, the tahini, the sugars, the orange juice, the vanilla, the cinnamon, the espresso powder and the salt to a bowl and mix with a fork or a whisk for 1-2 minutes until the sugar is almost dissolved. Combine the flour with the baking soda in a small bowl and add them to the olive oil/tahini mixture. Mix gently with a spatula until almost combined. Add the chopped chocolate and mix gently. Refrigerate the dough for 3-4 hours or overnight. Preheat oven to 365°F (185°C) and line your pan with baking paper. Divide the dough into 12 equal pieces and roll each piece into a ball. Transfer to the pan, leaving about 2-3 inches distance between each cookie and sprinkle with some sea salt flakes. Bake for 11 minutes. The cookies should look slightly undone in the middle. Take the pan out of the oven and tap it on the counter for the cookies to deflate and settle. This will give them a bakery-style look. Let them cool for 5 minutes and transfer to a rack to cool completely. Oooooh, I’m lucky enough to have both ground flaxseeds and chia seeds in my pantry! These cookies look marvelous! Pinning for later when my sweet-toothed beast rears its ugly head again! 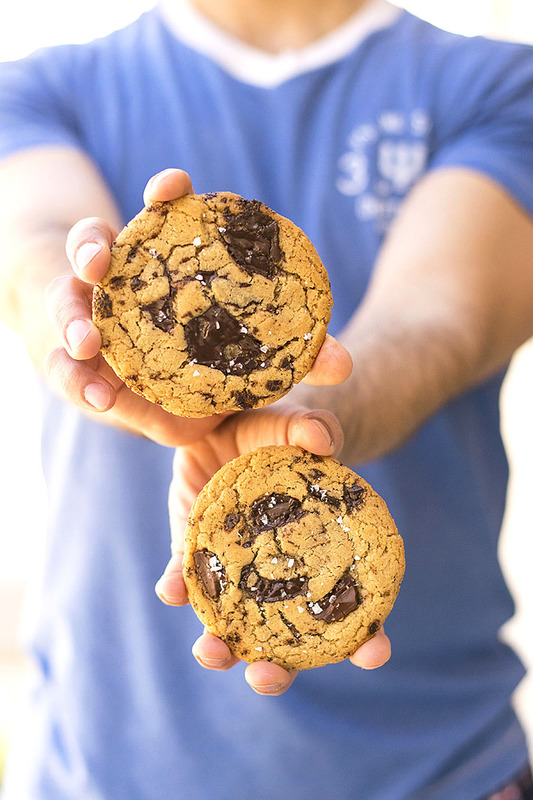 Oh, I can see the sea salt flakes floating in these cookies! I see that someone took a bite out of one of the cookies in the bottom photo- I can see why- they look delicious! Who that someone may be??? I wonder! 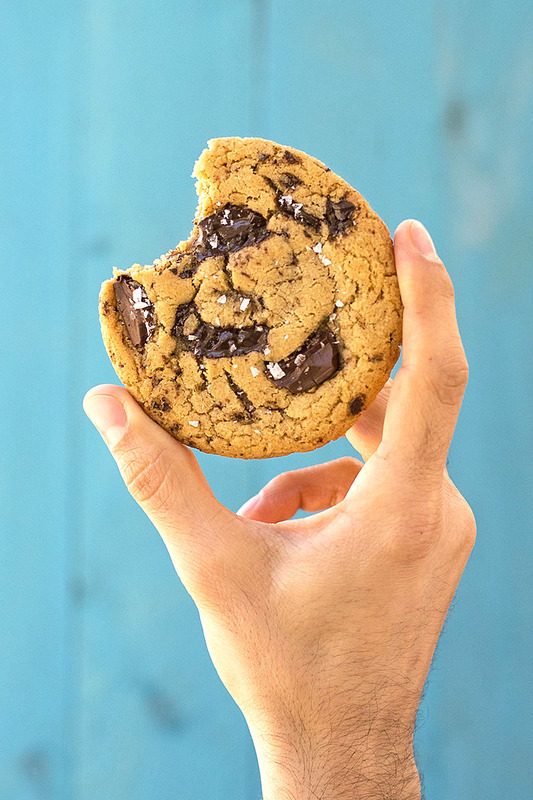 It’s been a while since I enjoyed a really good chocolate chip cookie. I can’t wait to give this recipe a try over the weekend. you mention substituting chia seeds for the egg, but the recipe does not call for an egg! am i missing something?? 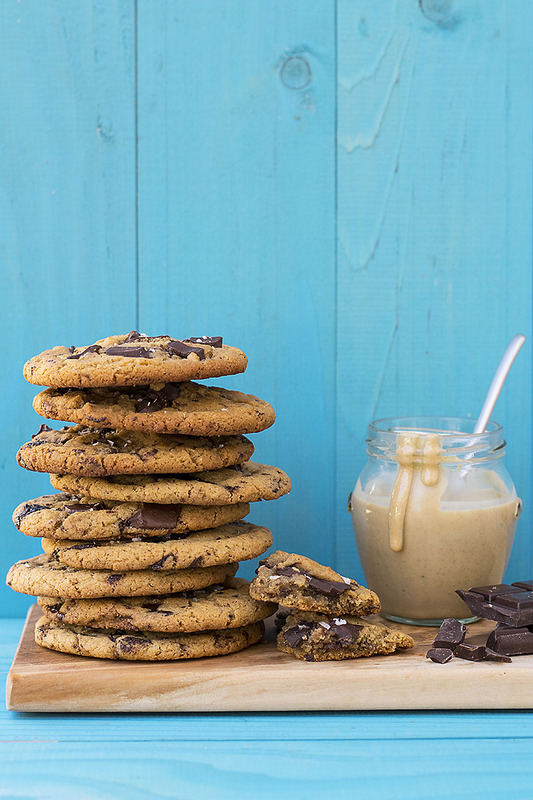 I am referring to the original recipe, these chewy olive oil and tahini chocolate chunk cookies.